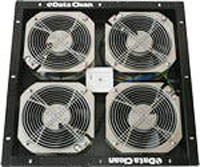 The CoolAssist access floor fan delivers extra cooling to those hard to cool areas where high-density servers have created hot spots, all the way to the top of the rack. Match the amount of cooling needed with the adjustable speed control, for variable airflow. Adjust fan speed quickly and easily from the top of the floor tile.